« Maybe what we’re looking for is a life of meaning that also makes us feel alive. While I was at my annual writing retreat in the rainforest this year, I had an interesting experience. It was Saturday morning; I had already been writing intensively for two days, and I had one day to go. I launched myself into a scene in my novel that was particularly emotional and heart wrenching. By the time I finished writing the scene, I’d become so deeply involved and invested in my protagonist that I was literally very upset. I felt like I’d gone through an emotional wringer: my chest was tight, the place behind my eyes ached, my breathing was more shallow. It was time to go over and have a communal lunch of homemade soup and grilled cheese sandwiches, but I found as I ate my mind wandered back to the scene I had just written, and I was having trouble focusing on conversation. My heart felt bruised, and it took a few hours before I felt more like myself again. 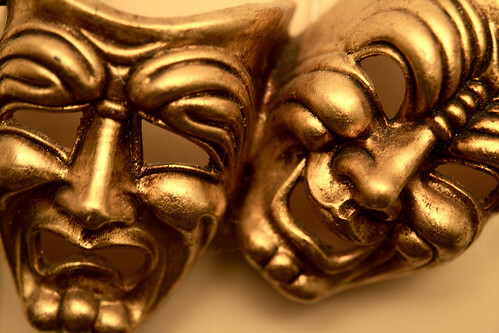 I thought of this experience when I stumbled across an article in the Atlantic: “How Actors Create Emotions: A Problematic Psychology.” It talks about the research being conducted by assistant professor of psychology Thalia Goldstein about the links between psychology and acting. In the article, she talks about the distinctions between pretense, lying, and acting from the perspective of cognitive psychology. What many writers of fiction do is very related to this as well. We joke about telling lies for money, but most of us also believe that what we’re doing when we tell a story is communicating an essential truth through our fiction. Nancy Kress, my teacher at Taos Toolbox, compares her writing process to Method Acting, and I go about much of my writing in a similar fashion. I inhabit the lives and worlds of my characters, and I try to feel as they feel. Just as actors experience psychological effects from their acting, so too do fiction writers. And it’s part of our job to learn how to deal with such effects in a healthy way. And if you really decide to go where your story, your novel, your characters are taking you, then in the process, you the writer will change. It’s not that every word I write changes me, but I am a different person at the beginning of a novel than at the end of that novel. I even change over the course of a short story, although usually not as noticeably. I wonder if this is true of all art, that in the process of creating it and engaging with difficult questions and truths, the artist inevitably changes. I also wonder if this is one of the reasons why art does make us feel more alive, because it is forcing us to grapple with truth in different ways than we are otherwise called upon to do. Back to the retreat. I let myself feel those feelings that had arisen from writing my emotional scene, and I reminded myself where the feelings had come from. I gave myself some space, had some food, took a little walk. And they faded. But the experience of writing that scene and going to the place my character needed to go to be true has made me a richer person. And that’s what I’ll carry with me going forward. I won’t say it’s as intense and as rich, but the virtual life experience may also be true for a very dedicated and involved reader of the fiction.